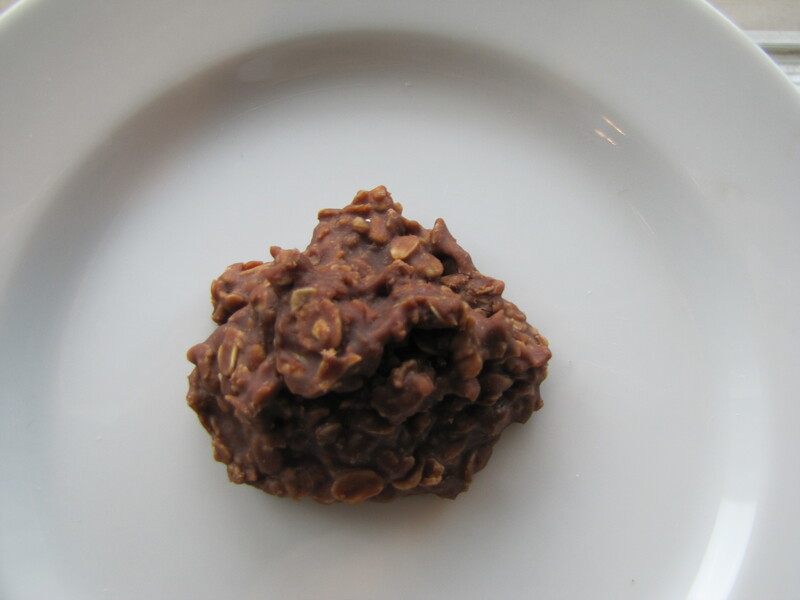 This entry was posted in Chocolate Cookies, Cookies, Oatmeal Cookie, Rated an 8.5 by bakingblonde. Bookmark the permalink. I remember making this recipe with my mom when I was a child. 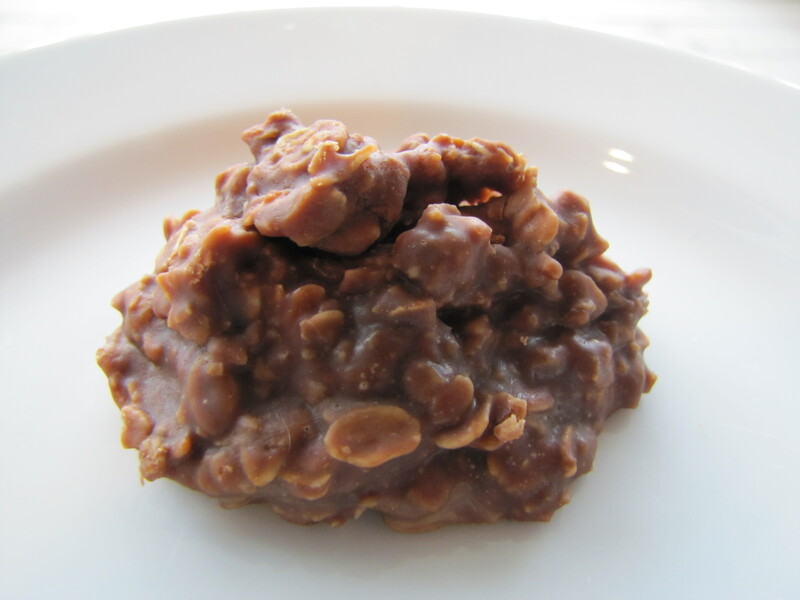 We called them “Chocolate Peanut Butter Oatmeal Drop” cookies. When I married my husband, I made them for him and he said they were called “Cow-Plop Cookies” when he was a kid. I just remember arguing over who got to lick the pan when they were done. Love these! So funny that I was just thinking of making some, but decided to check my reader to see if anything in there sounded better. Clearly, this is a sign I need to make them! Such a favorite; make ’em all the time. I tried to get tricky with the recipe once, and added some Karo – fail. My grandma used to make these when I was a kid and I couldn’t ever get enough of them. Yum! So I’ve made these twice now and neither one has set up properly. The second time I let them boil for 2 minutes and they still turned out just as gooey – like must eat with a spoon gooey. Any ideas what I could be doing wrong? So sorry to hear that! I would either A, let boil longer, more like 2-3 minutes (after the mixture starts boiling) and/or B. add more oatmeal. The humidity may be affecting your outcome. I do know some who find the recipe a bit finicky during hot humid months but I have had good luck year round. Sorry for the problems let me know if those ideas help. My problem is it always seem as though I have too much oatmeal and they are too dry. You can actually “see” the oatmeal outside the cookie 😦 Any ideas??? I boiled for 90 seconds at a full rolling boil, then added the peanut butter, vanilla and oats. Thanks! I would try adding less oatmeal, only add a little at a time until you reach the consistency you like (ie. more chocolatey). IF they are dry I think you have added too much oatmeal and may have boiled too long. Try reducing the time a bit to around 75 seconds and decrease it more from there the next time you make them if they are still too dry. I do find these to be a bit temperamental but once you know what works for you, they are oh so good! My boyfriend love the no bakes, but he likes them in cake or pie form. I am having trouble with them setting up. They are fudge like. I have tried boiling them longer, shorter, and adding more oatmeal. I am out of ideas. Suggestions? Store in the fridge? I have never had that happen, especially if you boiled longer. Usually that makes them more firm. You could always reduce the milk a bit so there is not so much liquid. I made with almond butter! Yum! I made my first batch at my moms house and they turned out perfect just like how she’d make them, so I went to the store for ingedents to make at home and they turned out gooey and a little oily still good though. turned out I accidently bought butter with like %50 vegetable oil in it! Haha I’m a beginner! I recommend you give measurements in weight so the results aren’t as random.